Recently a dear friend from the UK asked me to do a wee bit of research into Te Whāriki, a New Zealand Early childhood curriculum policy statement that has been getting a lot of attention internationally since its introduction in 1996. So, rather than putting the resources and links into an email I felt it would be good to share here, and to invite other folks to comment on, or add to the resources listed. The Education.govt.nz site describes Te Whāriki as "a framework for providing tamariki (children's) early learning and development within a sociocultural context" (source). The policy statement "emphasises the learning partnership between kaiako (teachers), parents, and whānau/families" (source). The approach means that the "Kaiako (teachers) weave an holistic curriculum in response to tamariki (children's) learning and development in the early childhood setting and the wider context of the child's world" (source). Relationships (Ngā hononga). Children learn through positive relationships with people, places and things. A short video (1 min 47 secs) that summarises Te Whāriki and discusses whether it needs review. Some of the resources below are free to access and / or download, others you can purchase. 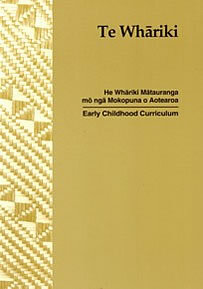 Download a copy of Te Whāriki: He Whāriki Matauranga mo nga Mokopuna a Aotearoa [PDF, 494 KB]. Report: Working with Te Whāriki (May 2013) - A report that presents "the findings of a 2012 national evaluation about curriculum priorities". Paper: New Zealand ECE teachers talk about Te Whāriki - This article explores "a group of nine New Zealand early childhood teachers’ understandings of aspects of their educational planning and practice related to the implementation of the national curriculum document – Te Whāriki". Paper: Te Whāriki, the New Zealand early childhood curriculum: Is it effec... - This article raises questions about the structure and content of Te Whāriki. The Pasifika Education Plan, which is "aimed at raising Pasifika learners’ participation, engagement and achievement from early learning through to tertiary education"
Registering teacher criteria describe "the essential knowledge and capabilities required for quality teaching in New Zealand. They apply to all teachers in their everyday professional practice seeking to gain full registration, or renew a practising certificate with full registration"
Guidelines and requirements for Early Childhood Education centre ow..., which provides "advice for ECE centre owners on getting the appropriate endorsement for the renewal of their practising certificate"
The Quality Journey/He Haerenga Whai Hua: Improving Quality in Earl...- a guide "designed to assist early childhood services in New Zealand to develop quality improvement systems and undertake quality reviews"
Nga Arohaehae Whai Hua: Self-review Guidelines for Early Childhood ... - a guide that was "designed to encourage early childhood education (ECE) services to adopt a process of self-review that complements external review undertaken by the Education Review Office (ERO) and examines how practice enhances children’s learning and development"
Education Review Office (ERO) reports for Early Childhood Education, and you can find specific reports here. Kei Tua o te Pae/Assessment for Learning - "a best practice resource that will help teachers continue to improve the quality of their teaching"
Ka Hikitia - Accelerating Success 2013 -2017 - overview of the "strategy to rapidly change how the education system performs so that all Māori students gain the skills, qualifications and knowledge they need to enjoy and achieve education success as Māori"
Code of Ethical Conduct for Early Childhood Services - guidelines for each standard, and this resource breaks down the ethics into tabular format.